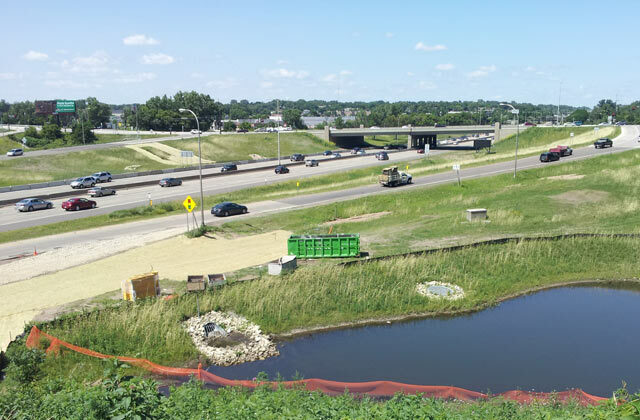 This $116 million construction project includes the realignment and complete reconstruction of 1.3 miles of I-35E between downtown St. Paul and Maryland Avenue. It also includes work on 10 bridges. The MnPASS High Occupancy Toll Lanes on I-35E are being developed within the project limits. One of the goals is to improve interchange spacing between Maryland Avenue and University Avenue by shifting the full access interchange from Pennsylvania Avenue to Cayuga Street. As the MOT Manager for the Lunda/Shafer Joint Venture, Alliant is responsible for developing an MOT Task Force and holding biweekly Task Force meetings throughout the project duration. Alliant is also responsible for developing construction staging and traffic control plans that maintain vehicle and pedestrian traffic flow through this heavily travelled corridor. We are also developing plans for all temporary construction elements including grading and paving, drainage, lighting, and ITS.